Head out on an epic road trip to visit some of the country’s most amazing sites. When you arrive home, pin your adventures on your very own 3-Panel US Travel Map and create a keepsake of your travel memories you will treasure for a lifetime. Through a partnership with National Geographic we are able to print and personalize this stunning, highly detailed map on premium canvas and transform it into a gallery wrapped 3-panel map to create a true work of interactive art. The extra-large size of this travel pin map provides you with bigger font sizes and more pinnable space. With its rich canvas texture, stylish antique color palette and contemporary frameless design, it’s not hard to see why our Executive United States Map with pins is a customer favorite! Use it to pin and track future and past travel destinations, office or client locations, or even as a learning tool for kids in the classroom or at home. 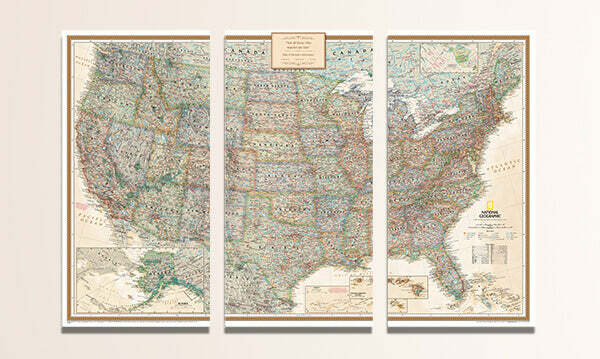 The options for this frameless 3-panel executive canvas map are endless! Have your map personalized with your name, favorite quote and a pin legend by selecting one of our six unique personalization options to truly make the map your own. Gift this large 3-panel Push Pin Travel Map to your wanderlust stricken loved ones and see why we constantly hear from our customers it was the best gift they’ve ever given! You, our amazing customers, asked for it and we delivered! 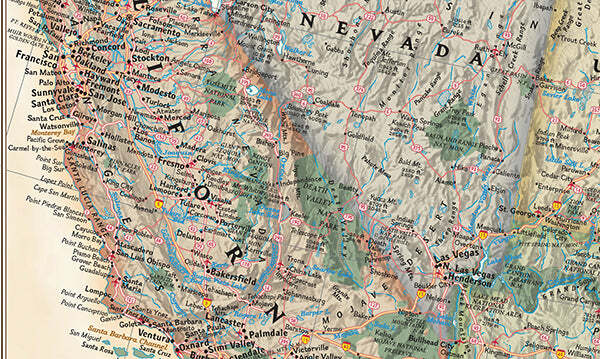 We have partnered with National Geographic to officially license their stunning Executive USA map to be printed on premium canvas. We also designed the 6 unique personalization options you see here so you can truly make your Push Pin Travel Map your own!